What a whirlwind it has been – three major conferences for Chilmark Research analysts in three consecutive weeks. Sure, the Epic UGM and Cerner CHC are industry leading events, but our own humble, inaugural event, Convergence, was influential in its own right. Our friends at Galen Healthcare and media partner SearchHealthIT.com provide cogent summaries of the event’s insightful presentations about payer-provider convergence strategies. Following our team of analysts offers their own highlights and key takeaways from Convergence. I enjoyed hearing from the Trenton (N.J.) Health Team and Boston Medical Center. They demonstrated that successful examples of provider-payer convergence can stem from collaborations in socially and economically disadvantaged areas, where stakeholders see common vulnerabilities (such as a lack of coordinated care management) that threaten their long-term financial survival. I also appreciated the message from employer Iron Mountain’s head of benefits planning, Scott Kirschner, about the need for employers to take value-based care (VBC) seriously. Kirschner noted that 95% of the company’s health plan costs are claims, and 80% of those claims are medical. Like it or not, employers have to find a way to get in between employees and their physicians – and to explore the widespread use of proven technology solutions that can address employees’ health and wellness needs without cutting into their billable hours. 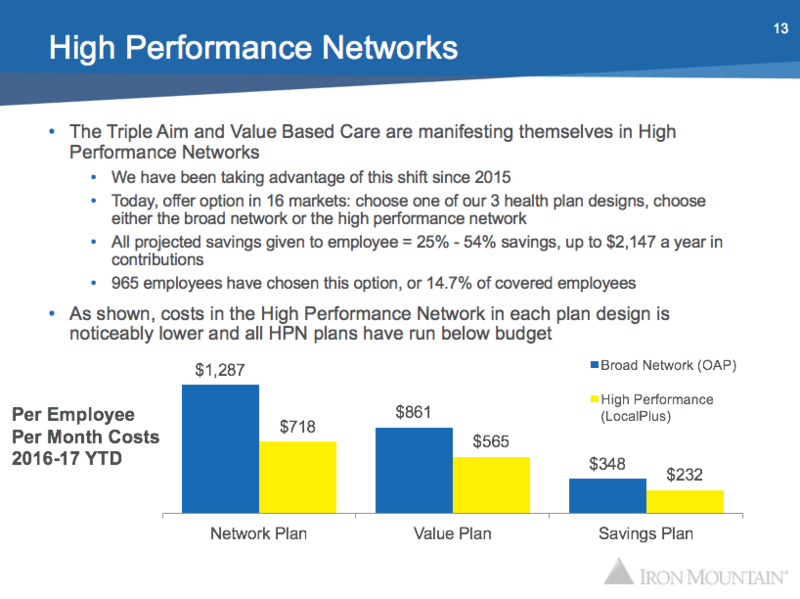 Kirshner also reflected on the savings – the clear ROI – that Iron Mountain has seen through aggressive moves to optimize benefit design. A key contributor to ROI is the use of High Performance Networks for employees across the country – HPMs are most often based on a converged model between provider and payer. Current insurer Cigna is not expanding its HPMs fast enough for Iron Mountain, which led the company to look elsewhere and ultimately choose Aetna for 2018 due to Aetna’s aggressive moves to drive towards a converged model. 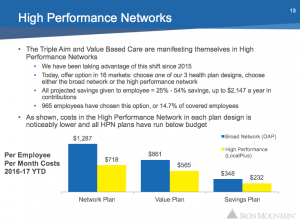 The impact of high-performance network structure and cost savings on employee benefits at Iron Mountain. Courtesy of Scott Kirschner. Convergence is underway in the form of providers becoming their own payers, as well as providers acquiring payers. Geisinger Health, for example, has moved to value-based contracts in 70% of its business and does not intend to go back to volume-based care. However, the trend is still in the early stages, just as the move to VBC is occurring slowly and, amid political turbulence, sometimes erratically. John Bulger discusses the Geisinger Farmacy concept during his opening keynote. The healthcare payer-provider alliances that are sprouting across the country, along with employer-provider deals, will require more advanced health IT systems to manage and analyze complex data undergirding value-based care: Big data and analytics, data governance, wellness platforms, and healthcare approaches like remote patient monitoring are key to the transformation. One major challenge to making both convergence and VBC produce better care and lower costs is the current widespread variability and lack of interoperability of health information. In addition, as healthcare transitions to value-based care, providers will increasingly be responsible for the entire continuum of care, from prevention to rehab. First, convergence is not for everyone – yet. The speakers and attendees at the event were those who either realized that something key and important needed to happen, or was happening, or they were making it happen. 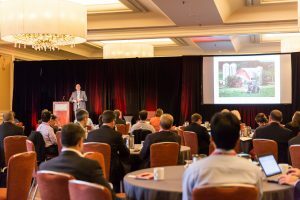 Out of the many health IT events going on in the fall months, leading vendors, providers, payers, and other stakeholders choose to attend this event – and in so doing, became part of this growing movement to transform our industry. Second, convergence affects everyone – now. The most powerful moment of the event had key leaders from the health IT community sharing their personal stories of their interaction with a dysfunctional system where each stakeholder, in its efforts to do what it thought was right for its interests, had the unwanted effects of increasing costs, decreasing quality, and increasing the friction of access. It affects the very patients, members, and employees the system is supposed to be helping – that is, all of us, even our leaders. Third, convergence is coming – there is hope. From payers like Aetna completely rethinking interactions with their members and their goals, to employers like Iron Mountain taking healthcare as a new core competency, to providers like Beth Israel Deaconess Medical Center reaching out to share data with their payers, to vendors like Allscripts, CareEvolution, Cerner, and Epic putting their best people and increased resources on population health management, we see many reasons for not just hope, but action and progress. The challenges of adequate access to data and the need to build new and improve old applications are deeply intertwined. APIs will be a major part of the solution. As we saw in presentations from Cerner’s Dave McCallie, Boston Children’s Hospital’s Dan Nigrin, and Google’s Aashima Gupta, providers are moving deliberately to adopt APIs on many fronts. Application programming interfaces (APIs) are being used to extend EHRs. 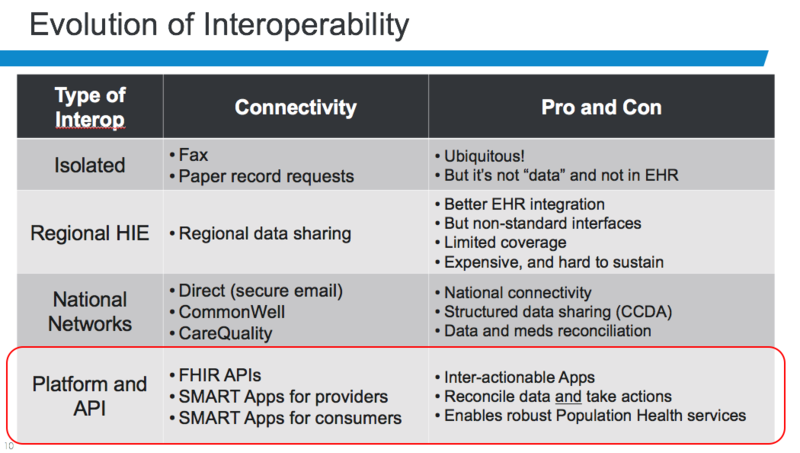 The combination of APIs built on the Fast Healthcare Interoperability Resources (FHIR) standard and SMART today allow clinicians to augment and extend their EHRs with new or different workflows. McCallie noted examples such as better clinical decision support, clinical trial recruiting, and different visualizations. Organizations and independent developers can build such extensions in a fraction of the time it would take for the EHR vendor to spec and build new features into their base products. APIs are being used to empower patients. Gupta used a Google Home device to show how APIs can make it much simpler for a patient to schedule an appointment at a local clinic using just a voice-activated smart home device. Google’s developer portal for healthcare helps engineers build the FHIR APIs needed to support customer-facing apps. APIs are being used to more effectively coordinate care. They provide a more efficient and easier-to-program way for different organizations and users to contribute data. At Boston Children’s, SMART has enabled an application that tracks patients’ disease symptoms and response to therapy over time. To date, more than 5,000 patients with complex needs have used the application to provide valuable information to clinicians. While these anecdotes attest to the progress being made, we still have a long way to go before the industry can claim that data is readily available wherever and whenever it is needed. Many eyes are now on the Office of the National Coordinator as it develops new rules stemming from the API provisions of the 21st Century Cures Act. On the one hand, there is some trepidation about how ONC will define data blocking and how fines will or won’t be levied. 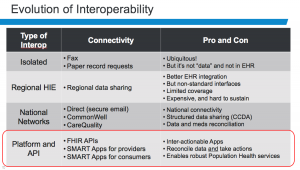 We know that EHR vendors must make patient data available “without special effort, through the use of APIs.” The specifics of what “special effort” means is still very much up in the air. The addition of a new requirement to provide a bulk API also raises questions. Watch our videos from the conference as we edit them, including full recordings of most sessions. Check out our Meet the Speakers series of in-depth interviews with more than a dozen Convergence presenters. Take our survey and tell us how your organization is progressing toward the transition to VBC. Follow us on Twitter and LinkedIn as we ramp up our research coverage of Payer-Provider Convergence topic, along with our other domains of Analytics, Care Management, Engagement, Interoperability, and Population Health Management. Contact us if you have specific questions or research needs, or if you’d like to become a member of the Chilmark Advisory Services and gain insider access to our analyst team.